Comfortable and intimate hostel. The staff were very lovely and helpful. Very chilled and in a great neighbourhood. Amazing hostel! We will stay here again for sure) Danke! This was my first time in Berlin & had a wonderful experience at this hostel! Definitely a great value. This was my favourite hostel I stayed in in Berlin out of 4. I wanted to extend my stay but unfortunately they were fully booked. Lovely staff, lovely backpackers, lovely common room, lovely cheap and artsy neighbourhood AND free coffee. (also showers with better water pressure than my own house) It’s a great deal with a very authentic Berlin feel, not like the big hotel hostels. I will be back for sure! Thanks guys. 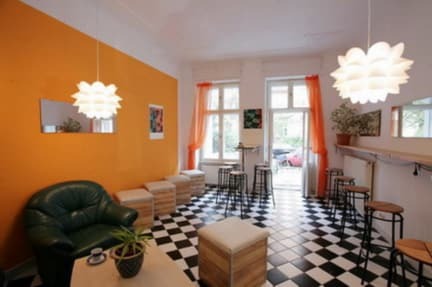 Very nice hostel, super staff, convenient location in the Eastern part of Berlin. The common rooms are nice. There are plenty of bathrooms. Big lockers are available (but locks aren't, though). Towels are provided. Wifi a bit weak. I had a pleasant stay :) will defenitely come back next time I'm in Berlin! Cozy private room with accessible clean bathroom. There's free cereal breakfast which was nice. The location is close to public transport and around it there's so many things to eat/do/look at. 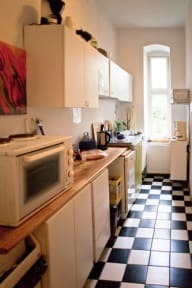 Great hostel with a homey feel right in the heart of friedrichshain, though nor the most social atmosphere. We had a small 5person reunion of our Berlin exchange. The hostel is very central located and the staff really helpful. There are a lot of bathrooms, some in better shape than others. There is a chilled out atmosphere and it is quiet at night. Prices were higher because of NYE, but overall a good hostel. Will definitely come back here!